Not to be confused with Prince Aloys of Liechtenstein. 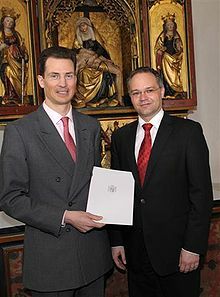 Alois, Hereditary Prince of Liechtenstein, Count Rietberg (born 11 June 1968, full name: Alois Philipp Maria), is the eldest son of Hans-Adam II, Prince of Liechtenstein, and Countess Marie Aglaë Kinsky of Wchinitz and Tettau. Alois has been regent of Liechtenstein (Stellvertreter des Fürsten) since 15 August 2004. He is married to Duchess Sophie in Bavaria. Alois attended the Liechtenstein Grammar School in Vaduz-Ebenholz and the Royal Military Academy, Sandhurst in the United Kingdom. He served in the Coldstream Guards in Hong Kong and London for six months before entering the University of Salzburg, from which he earned a Master's degree in Jurisprudence in 1993. Until 1996, Alois worked at a firm of chartered accountants in London. In May of that year, he returned to Vaduz and became active in managing his father's finances. Hans-Adam II retained the sweeping powers (the right to veto laws and elect judges) in a Constitutional referendum in 2003. On Liechtenstein Day in 2004, Hans-Adam II formally turned the power of making day-to-day governmental decisions over to his son, preparing for the transition to a new generation. Hans-Adam remains head of state. On 27 November 2005, Liechtenstein voters rejected an initiative that would prohibit abortion and birth control in the principality. Instead, a government-sponsored counter proposal was ratified. The pro-life initiative was supported by Roman Catholic Archbishop Wolfgang Haas. Alois was initially sympathetic to the pro-life proposal, but became neutral during the run-up to the vote. In 2011, Alois threatened to exercise his princely veto if voters approved a forthcoming referendum to legalize abortion in the principality. Such a veto was not necessary as the voters rejected the proposal. Following the Prince's threat, an initiative called "Damit deine Stimme zählt" ("So that your voice counts") was launched to change the constitution to prevent the Prince from vetoing legislation approved in referendums. The referendum was held on 1 July 2012 and 76% of voters upheld the Prince's power to veto referendum results. Prince Joseph Wenzel Maximilian Maria of Liechtenstein, Count Rietberg (born 24 May 1995 at The Portland Hospital for Women and Children in London). Princess Marie-Caroline Elisabeth Immaculata of Liechtenstein, Countess Rietberg (born 17 October 1996 in Grabs, Canton of St. Gallen). Prince Georg Antonius Constantin Maria of Liechtenstein, Count Rietberg (born 20 April 1999 in Grabs, Canton of St. Gallen). Prince Nikolaus Sebastian Alexander Maria of Liechtenstein, Count Rietberg (born 6 December 2000, in Grabs, Canton of St. Gallen). 11 June 1968 – 13 November 1989: His Serene Highness Prince Alois of Liechtenstein, Count Rietberg. 13 November 1989 – present: His Serene Highness The Hereditary Prince of Liechtenstein. 15 August 2004 – present: His Serene Highness The Prince Regent of Liechtenstein. Liechtenstein : Grand Star of the Order of Merit of the Principality of Liechtenstein. Austria : Grand Decoration of Honour in Gold with Sash for Services to the Republic of Austria (08/06/2000). Sweden : Recipient of the King Carl XVI Gustaf's Jubilee Commemorative Medal for the 70th Birthday (30/04/2016). Sovereign Military Order of Malta : Grand Cross pro Merito Melitensi – civilian special class – (16/09/2011). ^ a b c d e "Hereditary Prince Alois". Fuerstenhaus.li. Archived from the original on 2012-06-21. Retrieved 2012-11-29. ^ Rosenbaum, Harry (28 November 2005). "Voters defeat restrictive initiative". Associated Press. Archived from the original on 7 July 2013. Retrieved 7 July 2013. ^ Jordans, Frank (8 September 2011). "Liechtenstein prince threatens to veto referendum". Associated Press. Retrieved 7 July 2013. ^ Zeldin, Wendy (27 September 2011). "Liechtenstein: No to Legalized Abortion". Global Legal Monitor. Retrieved 7 July 2013. ^ "Liechtenstein, 1. Juli 2012 : Vermindertes Vetorecht des Fürsten" (in German). Sudd.ch. Retrieved 2012-11-29.